This is a common question we get as fishing guides. While there are many different access points and multiple variables to consider, our guides have put together a quick list of best places to fish for smallmouth, musky and trout on the French Broad river. Let’s start out with a list of access points. Use these as a cheat sheet when planning your outing. Starting at Mile 52 near the Asheville Airport all the way to Woodfin River Park. The last take-out is Woodfin River Park. Woodfin River Park take-out is not to be used as a put-in. There is a dam directly downstream from Mile 75. Mile 70 Jean Webb Park / Ramp beside Patton Ave. Most access points on the French Broad in Asheville are designed for kayaks, tubers or rafts. There are limited access points that have boat ramps. While launching or loading a boat can be difficult at some access points, there is usually a path or set of stairs that indicates where the access is. Before calling Southern Appalachian Anglers, look at the bullet points above to learn about boat ramp or kayak access points. 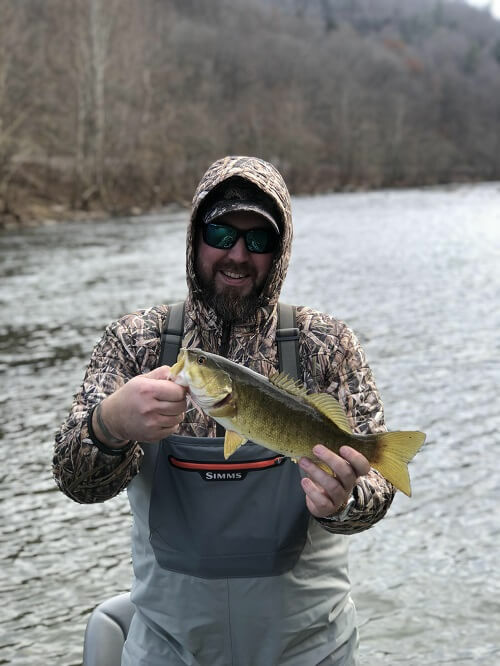 For guided smallmouth fishing trips on the French Broad river in Asheville contact Southern Appalachian Anglers or visit our smallmouth fishing page to learn more about targeting trophy smallmouth bass.